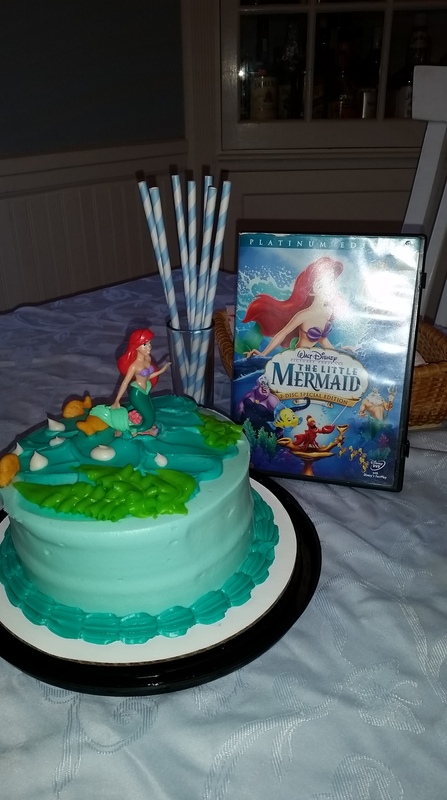 40 Years, 40 Disney Movies: Counting Down to Daddy’s Birthday Night 11 – The Little Mermaid! Teenagers. Dey dink dey know everything. You give dem an inch, dey swim all over you. Yep, that insightful quote combined with a heavy-handed Jamaican accent can only mean one thing. It’s time for yet another installment of DADDY’S SUPER DUPER GO INSANE B-A-N-A-N-A-S DISNEY MOVIE THON. So put down that banded, bulbous snarfblat and pay attention. Because this time we are talking some Little Mermaid. So yeah, for our twelfth movie we decided to watch The Little Mermaid. This movie is the movie that signaled the Disney renaissance of the late 80’s/early 90’s. Prior to The Little Mermaid (which came out in 1989), the last quote-unquote classic animated Disney movie to be released was The Fox and The Hound in 1981. Think about that. Sure, there were other movies – The Black Cauldron, Oliver & Company – that had some charm to them but I don’t think most would include them among the Disney classics. Then, following The Little Mermaid, we got Beauty and the Beast, Aladdin, Lion King, and so on and so on. The Little Mermaid proved that Disney could still do it. And man, does it still stand up as an awesome film. Onto the night. For this night, we were joined by Holly…which is awesome. She is super cool. I guess Steph had something to do. I know. I’m shocked as well. Oh also Dr. 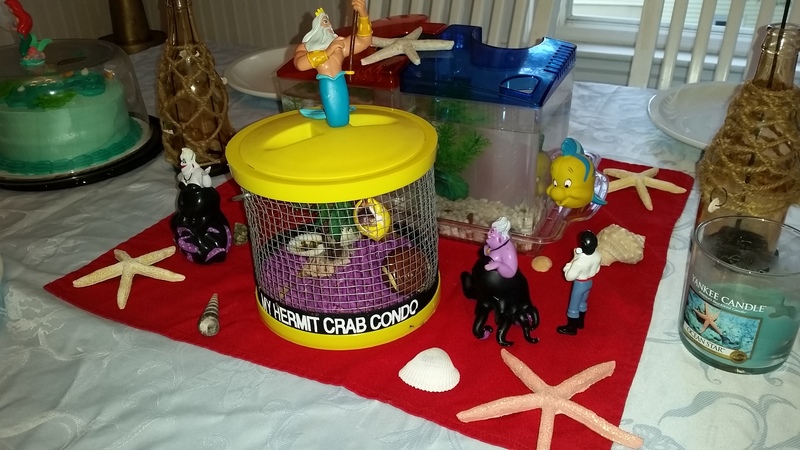 Evil, Mini-Me (the hermit crabs), Kevin and Bob (the fish) joined us as well. I love the food we do for this one. 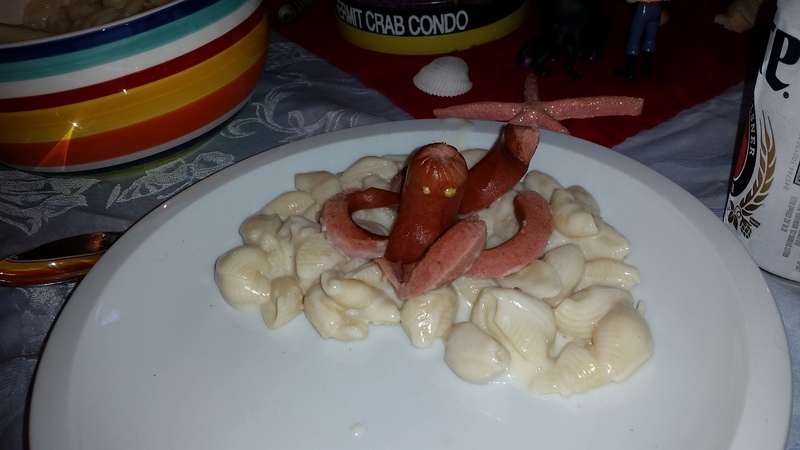 For the main course, we had some Ursula dogs (pictured below), shells and cheese and goldfish crackers. I’ll admit that in the past I’ve been a hot dog. They weren’t kidding when they called me, well, some food. Also, Nickie found this awesome cake at the store. Seriously, we obvs were supposed to be watching The Little Mermaid last Saturday. I mean…cake. We also bought stuffed quahogs but never got around to it. Quahogs? More like No-hogs. Am I right? The supermarket made finding dessert a piece of cake. Amirite? 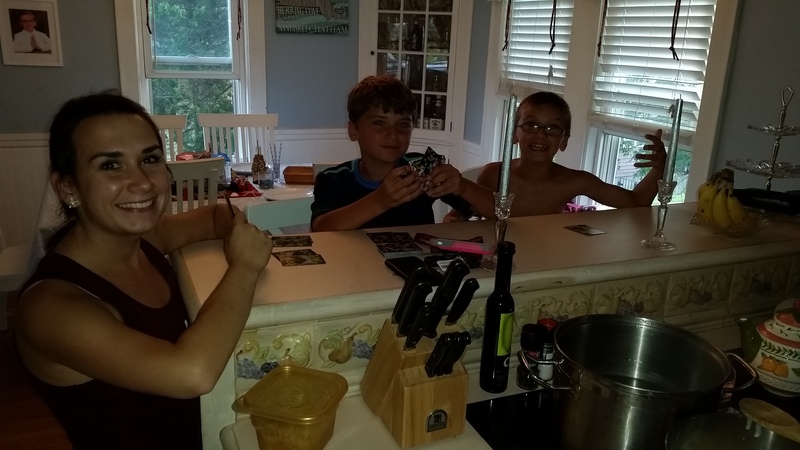 For the activity, the kids and Holly played Go Fish. On account of there are fish in the movie. Please pay attention. 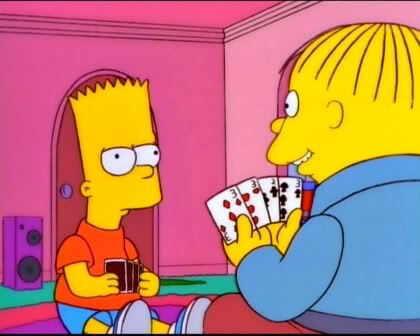 Bart: Do you have any 3’s? And the characters are all great in this one. Ariel, obvs. Flounder, the best friend that is always there for Ariel, despite his obviously crippling anxiety. Sebastian, the tough-on-the-outside musically-inclined crab that you know really cares for Ariel. Scuttle, the clueless yet loveable seagull. Eric, the um…the guy…that…erm…plays the flute I guess? Fine, Eric is weaksauce. But Ursula…a seriously awesome villain. She’s super evil. Crazy scary. Has an awesome villain song. And her backfat? That stuff is legendary. 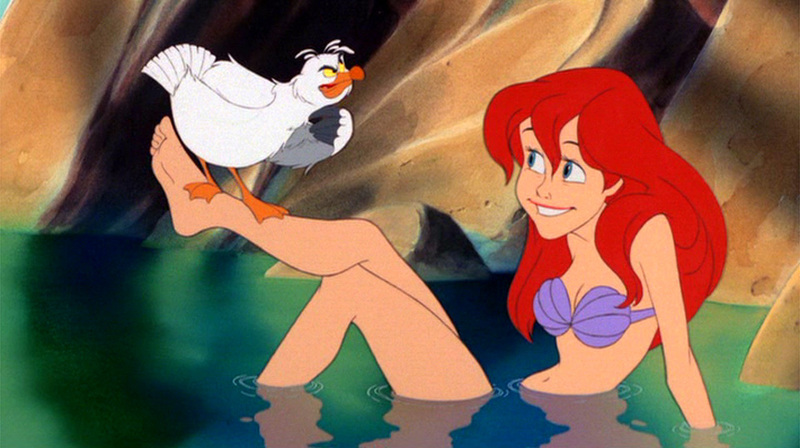 But beyond the music…or the awesome characters…or my off-putting crush on Ariel…the story is SO GOOD. Sure, there are some that chalk it up to a typical Disney “girl sees guy, girl does anything to be with guy, they live happily ever after” storyline but I have always felt there is so much more at work here. Ariel is a much deeper character than just some love-struck teenager. She is driven by more than just puppy love here. Even before she meets Eric, we know Ariel feels a bit suffocated by her life under the sea and knows there is a bigger world beyond the surface. Eric is not just a pretty face…to Ariel he symbolizes so much more. A bigger world. And she sets out to be part of that world, no matter what. She has to leave her friends and family. She has to leave behind something, her voice, that has so defined her until this point. And in leaving all the security of childhood behind to explore what else is out there is growing up, no? We watch Ariel, in her quest for love, find her own voice. Her own place in this world that up until now, she was viewing from the outside under the protection of her father. This is why The Little Mermaid, to me, is more than just another princess movie (which btw I have no problem with either). And one reason why it’s on my list of top Disney movies. Previous postD23 Highlights: Toy Story, Animal Kingdom, Star Wars…whoosh! Next post40 Years, 40 Disney Movies: Counting Down to Daddy’s Birthday Night 12 – Pinocchio! This is a favorite of mine and was my absolute favorite movie as a little girl. Just the message of figuring out where you belong and fighting for it always works for me. Love Ursula. Love the music. Perfection. 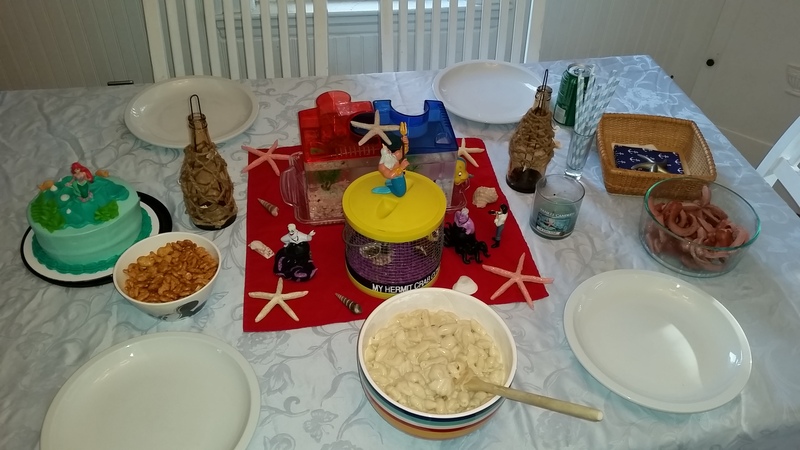 I am so envious of your Disney parties. They look like an absolute blast!!! Yeah definitely a good one And agreed. Our Disney nights are pretty amazeface. Thanks for the comment.